Master Ming-Lu is originally from Taipei, Taiwan and lives in Zurich since July 2008. He is not only a Tai Chi teacher, he also studies and researches the ancient scripts and is highly interested in the philosophical and theoretical background of Tai Chi Chuan. - Trainer of the National Tai Chi Chuan Association, Taiwan. - Representative of the World Tai Chi Chuan Federation in Switzerland. - Certified trainer and judge of Chen style Tai Chi Chuan of the Chen Xiaowang World Taijiquan Association. Chairman of the National Tai Chi Chuan Association,Taiwan and Chairman of the World Tai Chi Chuan Federation. Do you often catch a cold or cough a lot, have insomnia, headaches, pain of muscles, back or joints? Do you feel tired, burned out or have problems with digestion? 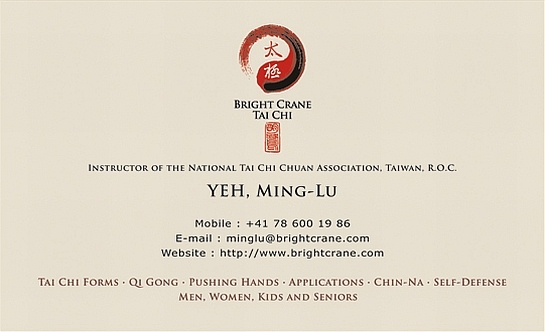 With more than 10 years of experience and as the representative of the World Tai Chi Chuan Federation in Switzerland Master Ming-Lu and his Bright Crane Tai Chi School offer a professional holistic approach to Tai Chi and Qigong training of the highest quality. Under excellent training conditions a long lasting improvement of your individual overall health condition is achieved. Learn to relax and re-establish the natural balance of your body with the help of the unique “Bright Crane 10 Tai Chi Qigong exercises”. Through these 10 movements body and mind will become one; harmony and happiness will find a way back into your life. The movements are taught in all courses. Course content: Bright Crane Qigong 10 Movements and Yang Style Tai Chi 24 Form. Course content: Bright Crane Qigong 10 Movements and Bright Crane Tai Chi 6 movements for health-building. Location: Gesundheitspraxis am See on Seestrasse 14a in Stäfa. Please register by mail or phone prior to first class. Tai Chi for adults at the Chinesische Schule Zürich in Wallisellen. Please contact the Chinese School directly, if you are interested in signing up for this course. 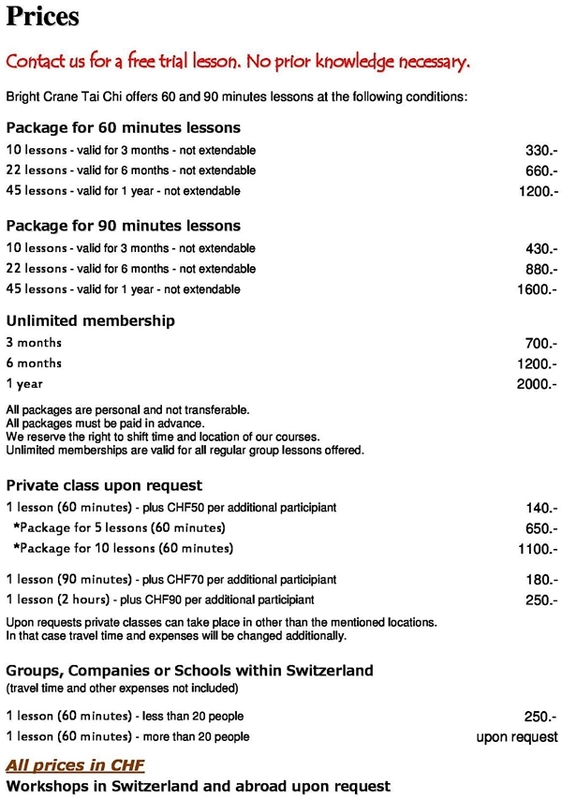 Location for private lessons: Yogastudio Christoph Schmid on Schmelzbergstrasse 50 in Zurich. Please register by mail or phone prior to first trial class. ATTENTION: Please register by mail or phone prior to first trial group-class.